Percussion Play is the world’s leading outdoor instrument manufacturer. Headquartered in the United Kingdom, the company has over 200 representatives in over 60 countries, including the United States. Kansas City, MO, January 07, 2019 --(PR.com)-- Percussion Play, the world’s leading outdoor instrument manufacturer, is excited to announce the installation of the first Baby Floor Piano in the United States. Percussion Play introduced the Baby Floor Piano and the Grand Floor Piano in August of 2018. Park Hill Elementary in Derby, KS has the distinction of being the first in the United States to install the Baby Floor Piano made by Percussion Play. 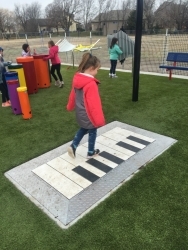 The school, which serves kindergarten through 5th grade, created a music garden as part of a bond initiative to create an ADA accessible playground.